Immediately Apollo was announced, there was the question of where to land. Based on the limitations imposed by flight dynamics, NASA narrowed their search for a site to an equatorial zone 10 degrees wide across the Moon's near side that ranged east and west by no more than 45 degrees from the central meridian. Within this area, planners looked for an apparently flat, open area within which an ellipse could be drawn that represented their best guess of the LM's landing accuracy and where a crew could probably find a level spot without having to hover for an excessive amount of time. Additionally, they wanted a relatively smooth ground track on the approach so that rugged terrain would not fool the LM's landing radar. 31 months earlier, Apollo 12 was sent to the western end of the equatorial zone beside Surveyor 3. Pinpoint landings such as this were achieved using two techniques. 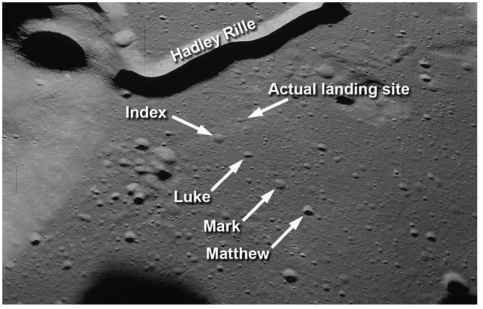 The first was a series of sightings through the CSM's optics of a feature at the landing site that helped navigational engineers to determine the site's exact position, not only in terms of its lunar coordinates but also its distance from the lunar centre, a value known as its radius of landing site (RLS), there being no 'sea level' against which to measure height. Then, as the LM came around from the Moon's far side for the last time before landing, engineers measured how the Doppler effect changed the spacecraft's radio signal and compared this with what was predicted for a perfect landing. This yielded how far the predicted landing site was offset from the intended site. It was then simply a case of applying this offset into the LM's computer to fool it into thinking that the landing site had moved, and have it alter their descent profile to reach the desired position. As Apollo matured and scientists increasingly took charge of the programme's goals, they looked to explore more scientifically interesting locations, choosing landing sites for the later missions tucked within mountain ranges that promised to provide more clues to the Moon's past. By doing so, Apollo's planners had to face the fact that, with the exception of the equatorial belt, the Moon had not been well mapped. The Lunar Orbiter missions had been tasked to support Apollo and, in doing so, had photographed selected parts of the equatorial zone in great detail. Once this task was completed, the Lunar Orbiter programme was released to the scientists to garner wider photographic coverage at the expense of resolution. Relatively poor imaging meant that Apollo 15, the first mission to leave the equatorial zone for a more northerly site, had to contend with significant uncertainty in the position of its landing site, not only in terms of its latitude and longitude, but also its RLS value. Additionally, the crew had to contend with landing at a site surrounded on three sides by mountains, and literally thread their way between peaks that rose more than 4 kilometres above the surrounding landscape. Planners designed a steeper approach trajectory that dealt with the mountains, and careful interpolation of the available Lunar Orbiter imagery allowed the site at Hadley Rille to be certified as safe for landing. 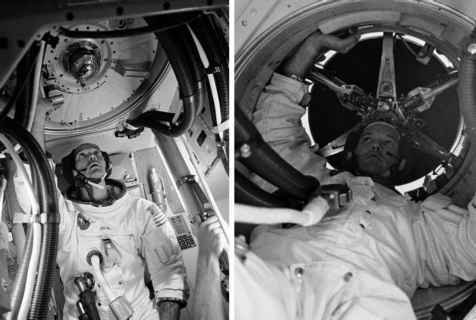 The ability to track a feature at the landing site, first practised on Apollo 8, gave the trajectory engineers the confidence they needed to make a successful landing exactly where they wanted. It was Al Worden's task as CMP on board Endeavour, to make repeated sightings of a selected crater close by Falcon's planned point of touchdown, appropriately named Index, at the end of a line of craters named after the books of the New Testament. The Apollo 15 landing site showing the crater, Index, that Worden had to mark on. spacecraft when it began to pitch down, and a note of where the landmark was expected to be, in both position and altitude. If that information was not forthcoming, approximate values could be obtained from the flight plan. It is interesting to note how longitude was handled by the software in the computers in the CSM and LM. Conventionally, longitude around a body would be expressed in the range -180 to +180 degrees. Using the 5-digit display of the DSKY, a large longitude value could only be represented to two decimal places, e.g. +178.62 degrees. Remembering that in this primitive computer there was no provision for the decimal point to float, we can see that all longitudes would have had to be expressed to two decimal places, and around the equator, 0.01 degree represented a third of a kilometre, an uncertainty that was much too large for Apollo. An elegant solution arrived at by the programmers was to stipulate that all longitudes would be handled by the computer after they had been divided by 2. The largest longitude values would now not exceed 90 degrees and could be expressed to three decimal places. This brought down the inherent resolution of the value to a mere 60 metres.